- Had trouble making a decision? - Needed a simple way to get input from your friends? - Just wanted to chat with someone about a decision? - Wanted to see what people with similar decisions have done in the past? - That there is a science that can help you with your decisions? - That this science of decision making uses tools that are taught in many universities? - That even experts in the field of decision making recommend that you get input from your friends about your decisions? Making a decision by yourself can be hard, and this is why we created Ahoona. Ahoona connects you with your friends and the world to get input on your decisions. It is people, not data, that make a decision! With Ahoona, you can see the reasoning other people have used to make a decision, get tips on important information, and use advanced tools to determine the best decision for you. Ahoona was created by leading experts in the field of decision analysis. 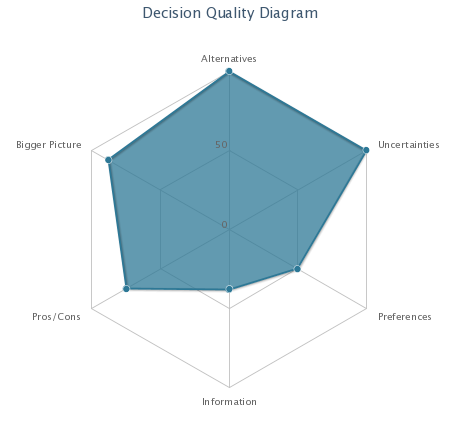 It was designed to capture all elements of decision quality into the analysis to help you make the best decision. Alternatives are the things that you can do in a decision. If you can only do one thing, then there is no point analyzing the decision: just do it! In most cases, however, we have many alternatives but we forget to include them in our analysis. This is where input from your friends or from historic posts becomes essential. Uncertainty exists in many decisions we face. They are the factors that affect the decision but are out of our control. We do not know how they will turn out. For example, if you are planning a sailing trip, you might be uncertain about the weather: it might be sunny or rainy. These two outcomes will affect the decision. In some cases you can get more information about the uncertainties such as looking at the weather forecast. If you know it will be sunny, you might go sailing, but if you know it will be rainy, you might do something else. Weather is an important uncertainty in this sailing decision. It might be a good idea to get more information about the weather before making this sailing decision. Sometimes your decisions can influence the uncertainties. For example, if you have an uncertainty about whether or not you will pass an exam, studying harder might increase the chances of passing in your favor. (i) it makes you think about possible scenarios in your decision. 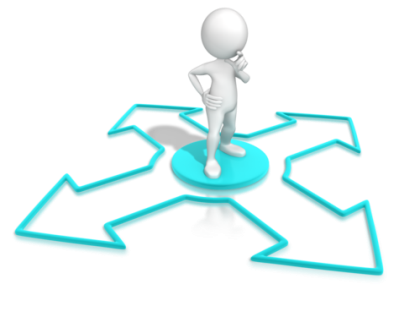 (ii) It helps you think about the information you need to gather before making a decision. (iii) It helps you think about things you can do to influence their outcome. Having good information is key in making any decision. Fortunately, there is a lot of information these days on the internet and in the media. Sometimes the answer to your dilemma or uncertainty might be available. You need to make informed decisions. Keep your information up to date or help friends with any information or links you might know of. What do you care about in this decision? Different people have different preferences. When considering a job offer, you might be interested in salary, vacation days, closeness to home, work environment, personal satisfaction, respect at work, and many other aspects. It is important to think clearly about the aspects of your preferences when comparing different alternatives. Even if you have good information, a good decision for you might not be the best decision for someone else, because the two of you might have different preferences. A list of pros and cons can help you think about what is good or bad with the alternatives you have and can filter out bad ones very fast. Be creative and think of a good set of pros and cons for the alternatives you face. You might be deciding which car to buy, and you have three cars in mind. Expanding the frame and seeing the bigger picture would consider whether you really need a car? If you live in a big congested city, where parking is expensive and transportation is easy, it might not be a good idea to even buy a car in the first place, and perhaps use public transportation or even buy a bike instead. This is the type of reasoning that the bigger picture provides. As another example, suppose you e-mailed a friend about going out and you did not get a reply. Then you decide whether you should remove her from your friends list or just ignore all her future calls because you did not hear back. Looking at this decision from a different perspective would consider other possibilities why she did not reply to your e-mail. She could be ill, travelling, or even away from the internet because of an outage in her area. Looking at the decision from a different perspective helps you think of other thoughts, decisions and alternatives such as: “Perhaps I should e-mail her again and ask her if she is OK?” Ahoona helps you look at the problem from different perspectives through a bigger picture view. Ahoona also provides room for discussion about a decision post. There may be decisions in life where you or your friends have accrued a wealth of experience and are comfortable providing a recommendation based on your own judgments. Ahoona enables you to gather experts’ recommendations from your friends. Ahoona helps you think about all elements of a decision to make sure you have considered all the important factors. Then Ahoona compiles these factors into an advanced decision-making model to help you make the best decision. You can also use Ahoona to help other people with their decisions. This is an opportunity for you to help others with your expertise. Ahoona is a lot of fun, and it is free. Check it out now.